Ready to begin your journey to happiness? In my book, Be Happy Now, you’ll find strategies to help inspire you to move beyond fear and into fulfillment, love, and happiness. Everyone wants to be happy, yet most are preoccupied with stress, overextension, and discouraging thoughts. While appearing to be successful, you may feel stuck or plagued by discouraging self-talk. Now, for the first time, I’m sharing my professional guidance with the world. In this book, I share strategies to help inspire you to move beyond fear and into the conscious choice of embracing fulfillment, love and happiness, even amidst challenges. Katie B. Smith places a spotlight on areas that need further development to strengthen one’s ability to make smarter decisions and reach desired outcomes. I now have more fulfilling relationships, career opportunities, and a genuine expression of myself. If you are stuck envisioning your next chapter and are willing to do the work, Katie’s integrative method will enhance you, your mission and your life! In Katie’s book, “Be Happy Now,” she gives real life examples from her journey to happiness, spiritual enlightenment, alignment with her authentic self, and a greater sense of meaning in her life. She couples these real-life experiences with exercises you can do, and questions you can ponder, to work toward achieving the same results. The book is chock full of wise thoughts and great activities to help you create your own happiness now. Many of these thoughts in Katie’s book resonated with me and shifted my perspective. Then she’d follow up with an exercise or question that helped me move forward. One example was the thoughts: “There is a part of our culture that believes we have to power through, no matter how we feel . . . “ and “There is a cultural belief that it is important to struggle . . . . “ Then she asked this powerful, actionable question: “What is one thing you could give up and make space for not doing?” Later she added a powerful action: “Sometimes it requires surrendering, giving up the to-do list, and allowing your brain to take a break.” It’s a big step for me, but I believe I can give up my to-do list for short periods and create more happiness in my life. So you can see that this is a practical, yet personal, book about achieving happiness that will help you on your journey to creating your ideal life. I absolutely adored this book as much as I do Katie herself! She is one of my yoga teachers and one of those people that just has a light about her. I picked up her book and couldn’t put it down until I finished it! She just makes sense of a lot of things and shares her personal experiences in life to help see things clearly. I cherished the messages inside! Read it!!! This book is terrific! I read it non-stop and took many notes. Its a great way to kickstart your own journey and take immediate stock in your own awareness. I learned so much with her stories and sage experiences. She does not leave the reader, you feel her presence along side of you working every step of the way with her tools and deep probing questions that allows you to really think about what is going on full 360 in your life. This book does the first step on being able to capitalize on a new roadmap/plan for yourself and knowing that she can help you put that together with an integrated approach. Confident with your choices, finding ease and joy with each moment of your life, is the way to living a life that feels good. It’s the kind of life we all want. But in a world that feels more stressful, judgmental, and hard; the mere thought of being happy seems impossible. And then monkey mind kicks in to add its two cents. Katie’s book “Be Happy Now” cuts through the noise and shows us how to find joy and fulfillment when you look inward and listen to the wisdom of your body, mind, and heart. Combining corporate experience with her expertise in yoga, meditation, and wellness, Katie shares the practices that have profoundly changed her life and the lives of her executive coaching clients. Many of the exercises are simple to do…like focusing on your breath. But what makes the technique powerful is the context within which Katie teaches you to use your breath, and that is life changing. This is a beautifully written book, and each page offers actionable wisdom and inspiration. I know I will return to it often, to read a page or two as a guide to keep me on track to living a life that feels delicious and happy. Katie has an extraordinary ability to extract what is most important to you and what is in the way of creating the life you want. Her integrative approach removes the separation between professional, physical, relationship, and spiritual goals. This book helped make my vision statement a reality and I now have the peace, passion and presence to trust myself and move forward with purpose and freedom. 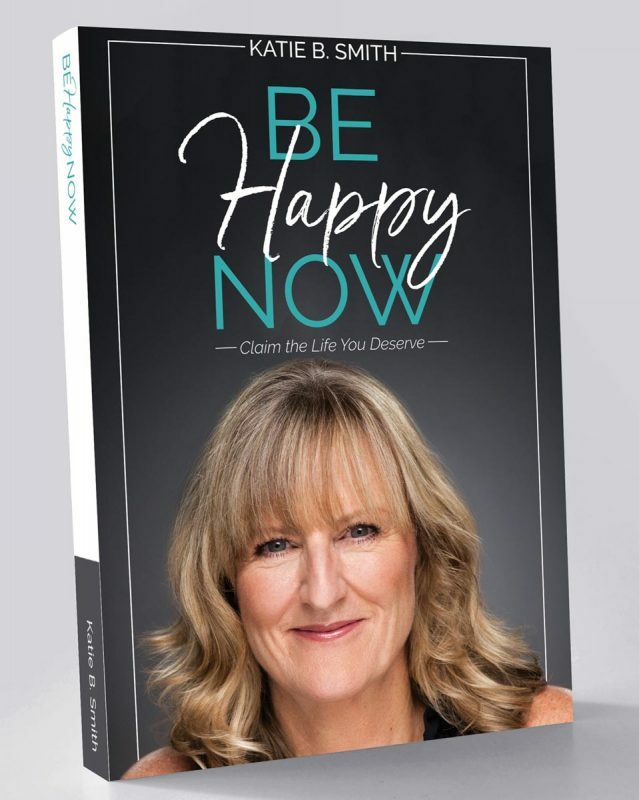 This book, Be Happy Now, is a quick read that provides snapshots of Katie’s life journey combined with the bigger picture awareness of personal growth and development. It helps to simplify how we see and live our lives and provides both education as well as tools to help you to personally identify your own desires as well as what is getting in the way of achieving what you want. It’s a combination of spirituality, a coach approach and the realities of everyday life. It’s inspiring, practical and a great resource for those who are ready to look within. So much of what Katie wrote was validating for me. And so much was a reminder of simple steps I can do to integrate happiness into my life. Her words were flowing with realism and life experiences that have obviously shaped her path. Refreshing to read such an honest and beautiful book. Well done! Katie’s book arrived on a day when I was feeling down, and when I read the first few pages, I cried at the reminder of who I really am. Her “voice” in the book is so sweet, and the tips and suggestions such good reminders of the work we must do every day.